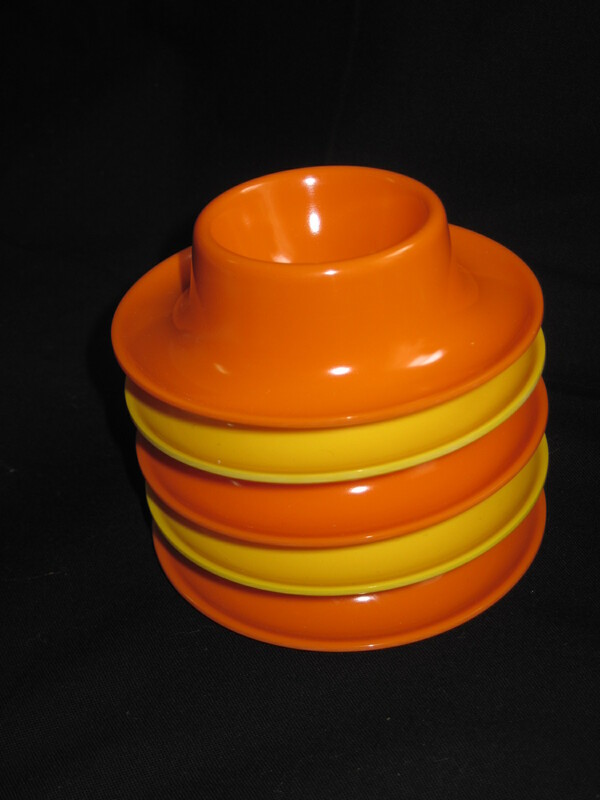 Mid Century Bakelite decanter set shaped like a bowling ball with a figure bowling perched on the top of the ball. Inside is a glass decanter with a bakelite push button for dispensing liqueur and six glasses fitting in a chrome insert in the bottom of the ball. This item will be available only at the Ottawa Antique and Vintage Market November 4th and 5th, 2017 where I will have a large booth. The Antique show will be held at the Carleton University Fieldhouse on Bronson Ave. in Ottawa, Ont. Please note this item is now SOLD!! How cute are these??? I can just picture what a funny sight it would be with these colourful little birds holding up wet clothes on an outdoor clothesline. 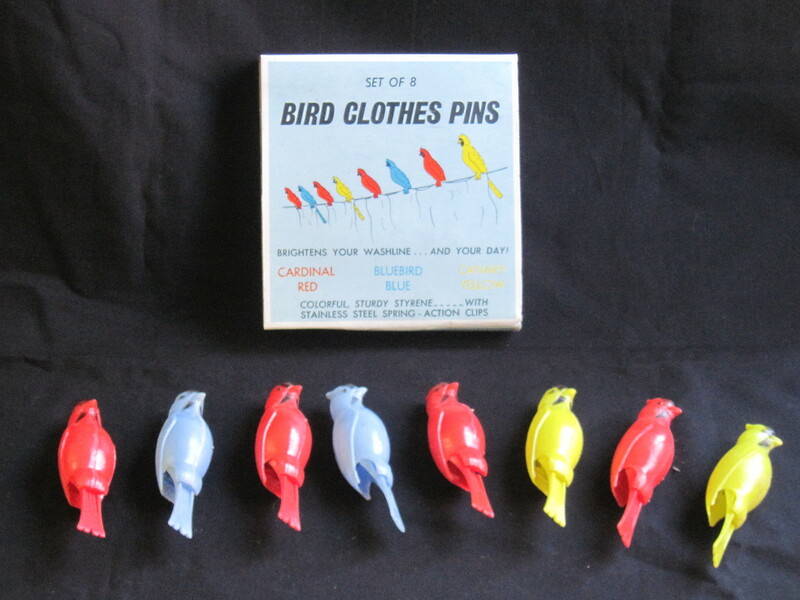 The box contains 8 plastic bird clothes pins with stainless steel spring action clips. They are in great condition, probably never used. The spring action appears to be working fine. Come visit my booth at the Ottawa Antique Show at Carleton University Fieldhouse on Oct 25th and 26th 2014 to find these and other charming mid century collectibles. Please note these are now SOLD!!! 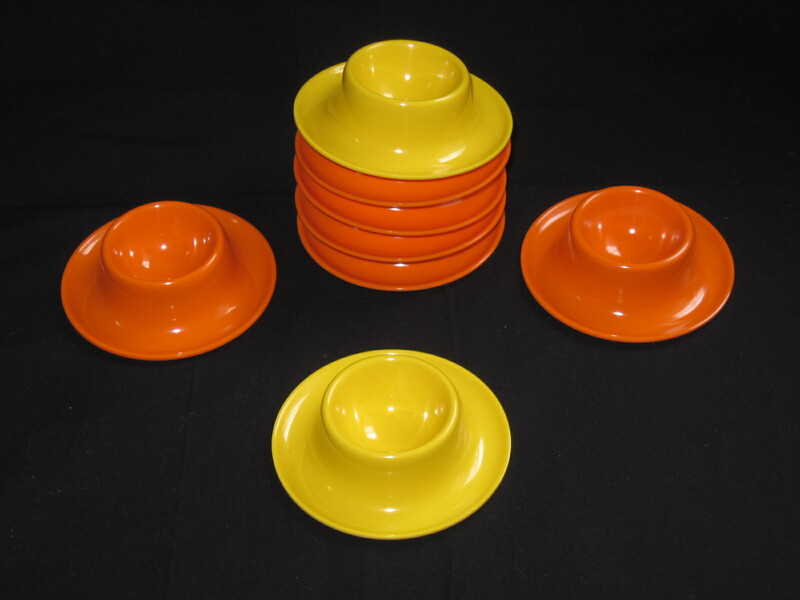 This partial dish set was manufactured by Dorchester Dinnerware who bought their plastic mold powders from American Cyanamid Co. Only companies that used Cyanamid plastic could name their wares Melmac. By the fifties there were over a hundred companies throughout the states (and a few in Canada) that bought from Cyanamid. 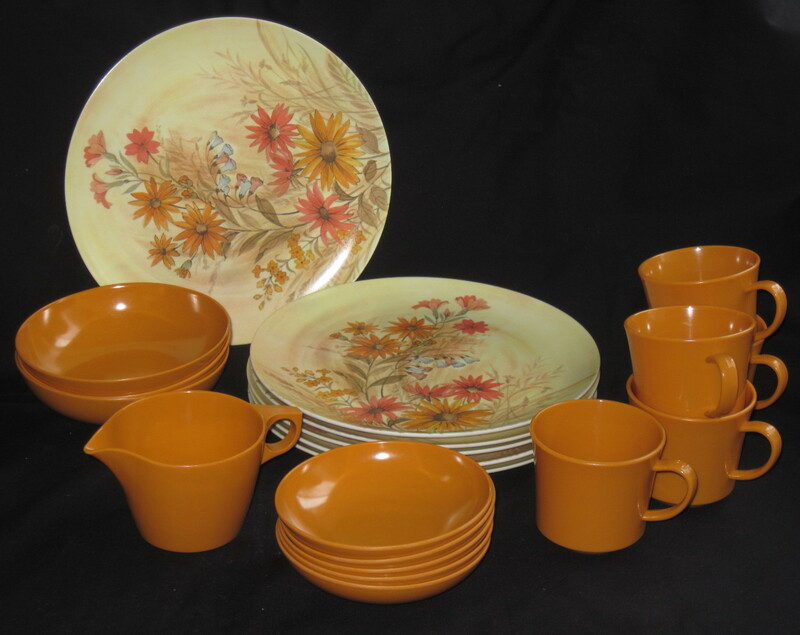 I don’t know the actual date of the dishes, but the colours suggest the sixties rather than the fifties. The plates have been used but still have lots of life in them. The cups and bowls are in really nice clean condition. These will be availabe at my booth at the Almonte Antique Market, 26 MIll Street, Almonte Ont. Please note these dishes are now SOLD!!! 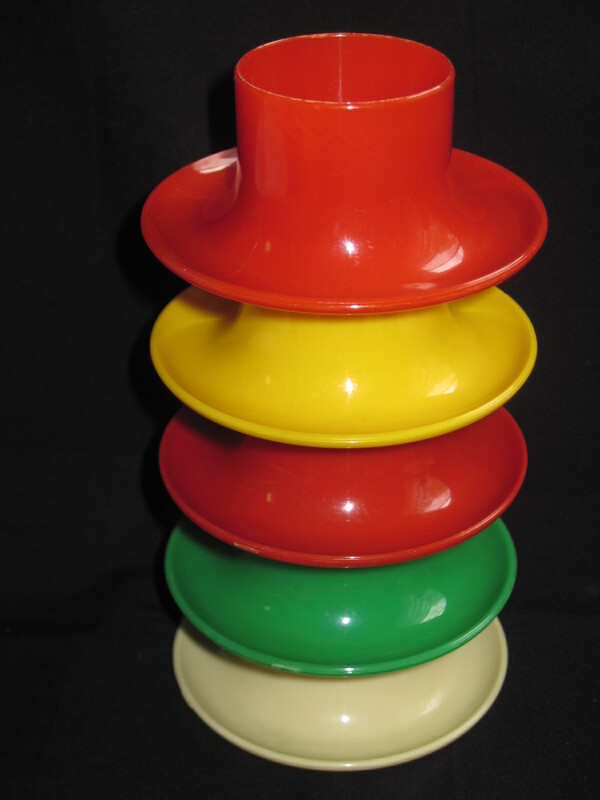 There are quite a few different styles, shapes and sizes of plastic egg cups out there to collect. Many of the plastic egg cups do not have a maker’s mark on them but some are quite recognizable by their shape. The dark blue and white ones are Rosti from Denmark, the tall stack of primary coloured ones are Egg-Cessory, and the others in the photos are unmarked. I purchased the Egg-Cessory egg cups from a kind friend who agreed to part with them. They were just so cute, I had to have them!! 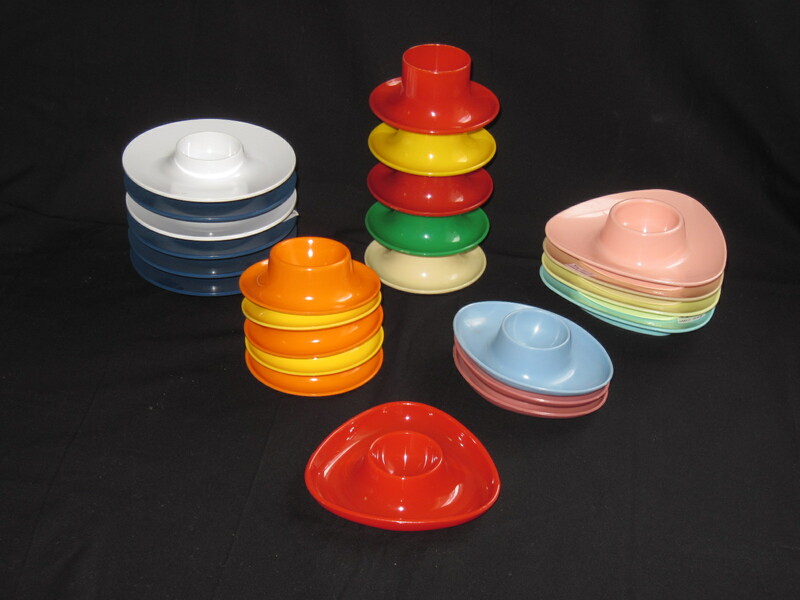 They remind me of flying saucers which would fit right in with the atomic era styles of the mid century. Priced at between $2 and $4 apiece. They are at my booth at the Almonte Antique Market, Almonte ON. 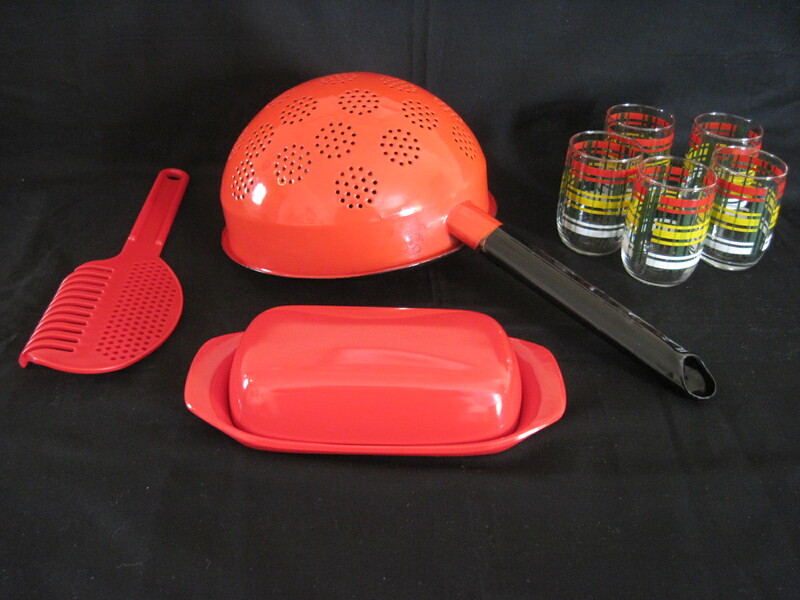 The red melmac butter dish was made by GPL, in Gatineau, Quebec, probably later 50’s or early 60’s. It is in excellent condition. Priced at $ 15.00. If you are interested in all things melmac I found a really great blog. http://retrochalet.blogspot.ca. Check it out!! 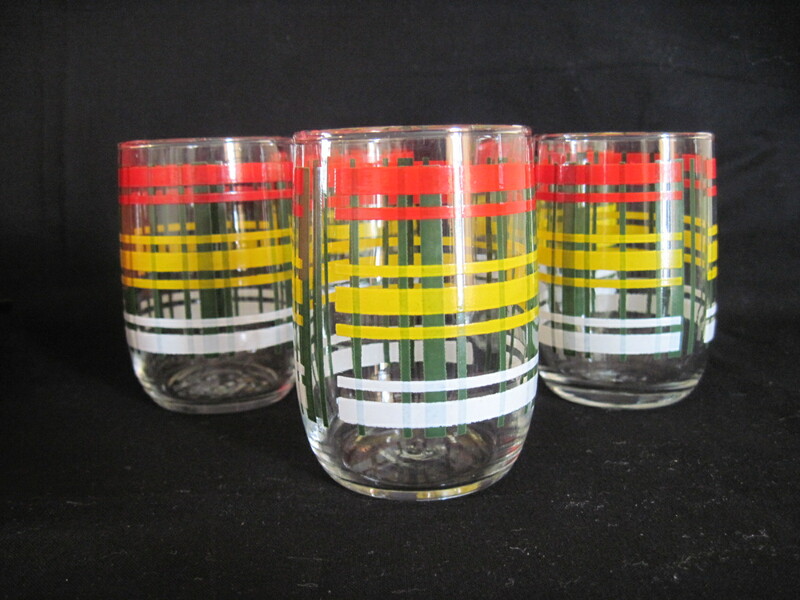 The 5 striped juice glasses go really well with the reds. One has a little chip on the edge so I will only be selling a set of 4, which works well for most people anyway. 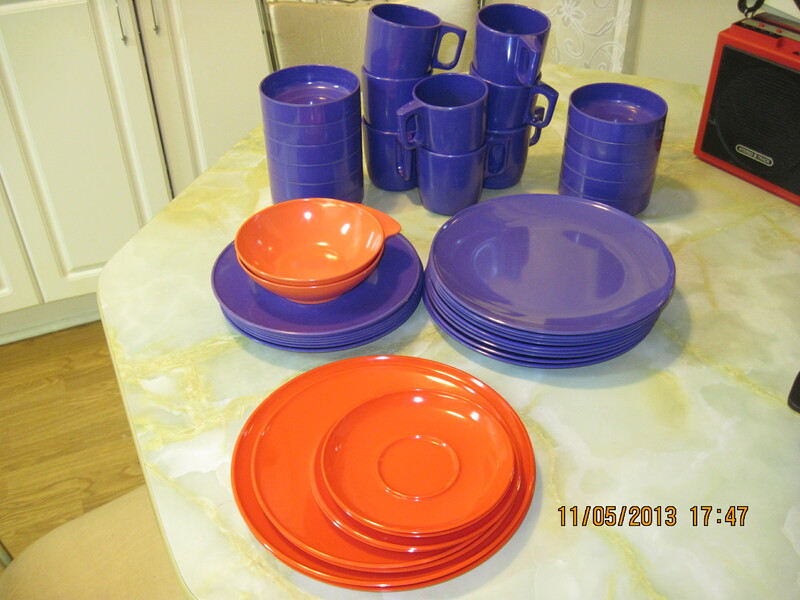 Priced at $ 12.00 for the set. All of these will be available in my booth at the Almonte Antique Market, 26 Mill Street, Almonte ON. 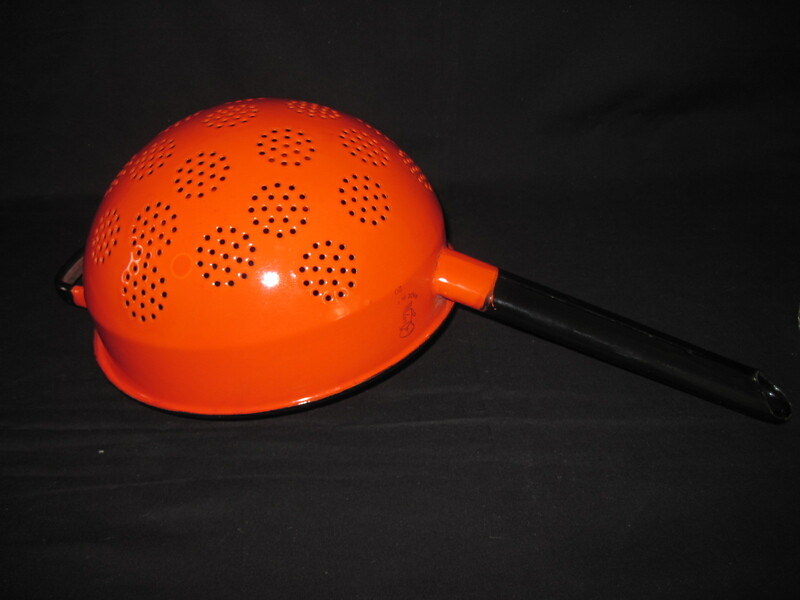 Please note that the glasses and strainer are SOLD!!! This month is the 50th anniversary of the Beatles (John, Paul, Ringo and George) appearance on the Ed Sullivan Show. 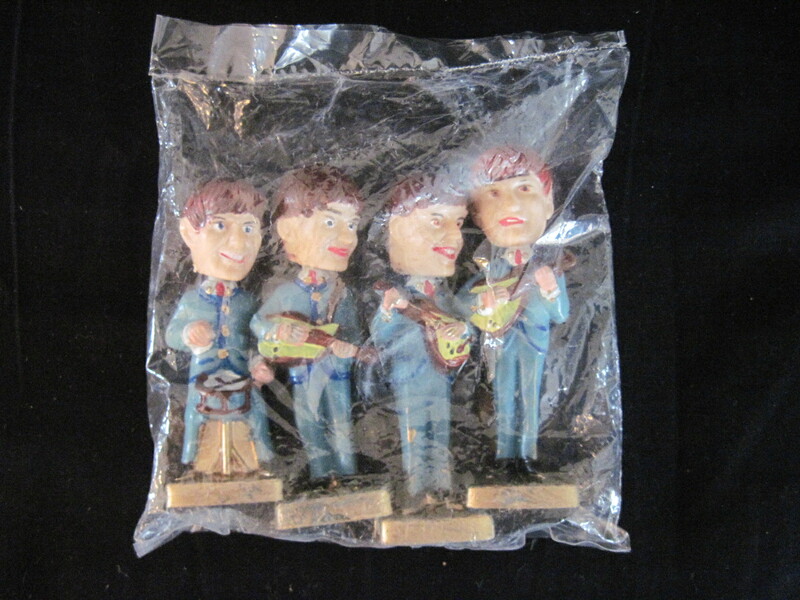 I have these wonderful Beatles Bobblehead Caketoppers that are still sealed in their original plastic bag. They are plastic, made in Hong Kong and measure about 4″ tall.